A wicked snow and cold snuck in during the middle of the night. It was not precipitous. The gray days and rain had cooled things considerably the two days before. I was caught unprepared. For others, after millenia of adjustments, it was just another day on the mountain, with a cool drink. 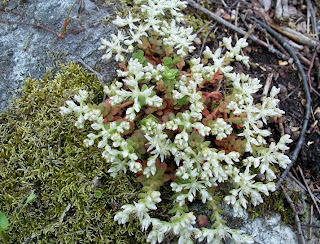 The Stonecrop, Sedum ternatum looks best in more sun and spare conditions, forming a more compact and denser plant. 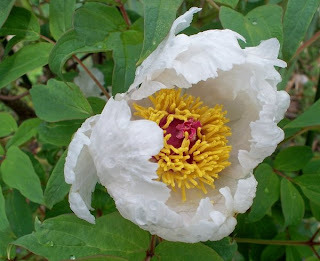 The bloom is quite large for such a small plant. Now what is this? 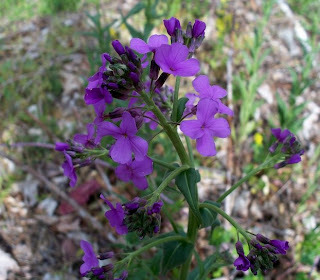 It has four petals like the Dames Rocket, Hesperis matronalis, the flowers are more purple, the leaves are more linear, without the serrated edges and more pubescent than glossy. 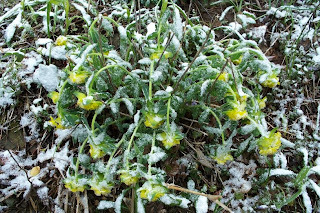 It was bowed under the coat of snow and ice this morning. By late this afternoon it had perked up as if nothing unusual had happened. 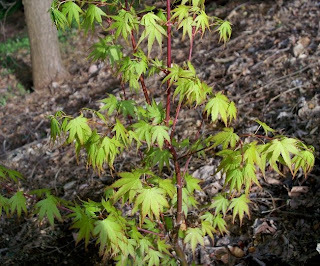 My first ever Japanese Maple seems unscathed. The resident gardeners JM still recovering from last years Great Easter Freeze had put out a vigorous flush of new growth. It is not looking so well. The next couple of days will tell more. After the snow melted and the sun came out, we managed to finish the front windows on the last section of wall framing and redo one window frame that wasn't quite right. Other details were attended to and some figuring for the next steps of construction were discussed. Through downpours and ice laden arctic blasts the cozy little cabin and stone walls are still there, inching ever closer to becoming a home. It was only supposed to go down to 36 degrees according to the weather diagnosis. I didn't bring anything in. I was going to do that tonight when the diagnosis called for patchy frost. I'm not too worried about the gardens and all the plants in the ground. They have been through a lot and come out smiling. But who will survive and who will die in my trays of sprouting seeds? A gray and rainy day was perfect for relocating some things that fell out of the ground at the resident gardeners place. 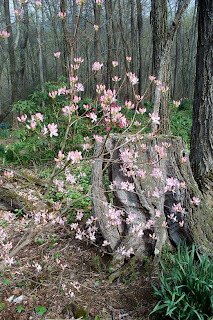 No I did not dig up this pink Azalea. The diffused light was good for taking pictures when I woke up quite late this morning. I must have needed the extra rest. 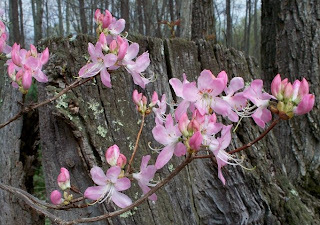 The Rhododendrons, Dogwoods, Cherry Trees and Azaleas now believe it is spring, and have started their own show. The various un-named Azaleas go first. 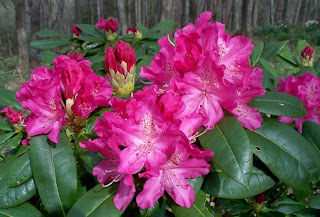 There are a lot of Rhododendrons to follow. It was predicted to rain most of the day and the day was half over by the time I got moving. 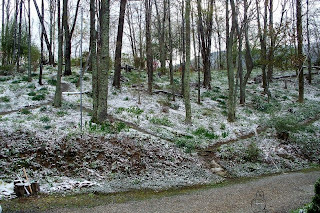 It seemed the perfect time and conditions to relocate some low mounding color and texture to the hill below my cabin. This slope in the utility easement is south facing and gets full sun most of the day. Sun in the forest is a precious resource not to be wasted. 2 - Juniperus squamata 'Blue Star', received as a landscape consultation tip of sorts. 1 - Carex elata 'Aurea', I bought myself something. 8 - Iberis sempervirens, they germinate in the driveway at the resident gardeners. A lot of good stuff germinates in the gravel driveway. 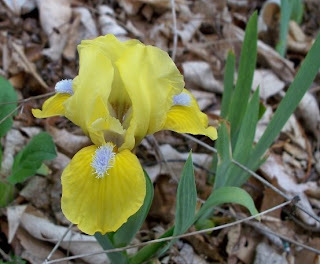 5 - Bearded Iris, They are unknowns until they bloom and were crowding the path at their former home. 2 - Alyssum montanum 'Basket of Gold', they germinated in the gravel drive too. 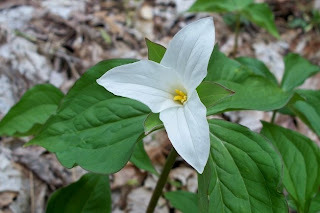 3 - Daffodil groupings, the Hankodils are at the forest edge. 6 - Spiraea japonica, transplanted out of the gravel driveway today. 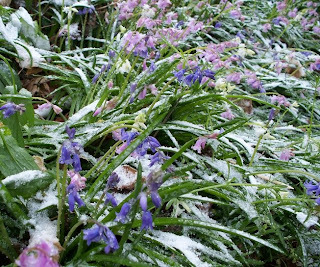 The Chionodoxa and Ixiolirion bulbs from Elizabeth are on this lower portion of the slope too. There is a lot of ground to cover, but this is a start that I will be able to propagate from. Walking paths and maintenance paths need to be formally dug into the hill. I'll add that chore to the list. 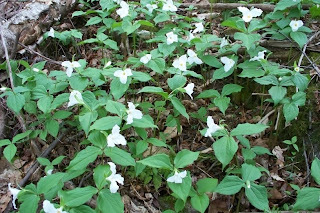 Starting with pure white, both large and small, the Trilliums have begun to deviate. This is indeed pink. 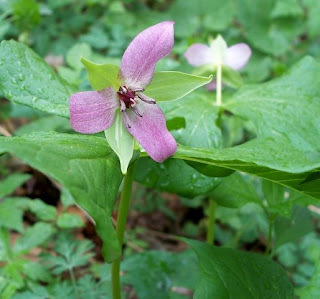 These may be shades of Trillium cernuum in the after glow. 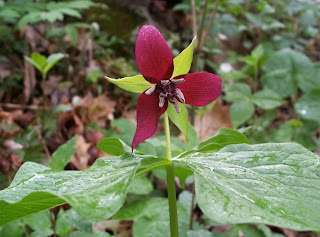 Trillium erectum is decidedly red. 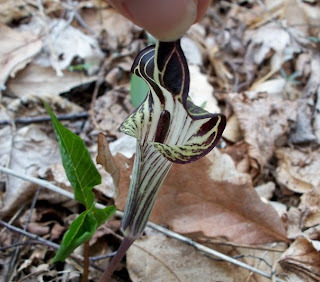 No need to worry about relocating the same Jack In The Pulpits, Arisaema triphyllum. 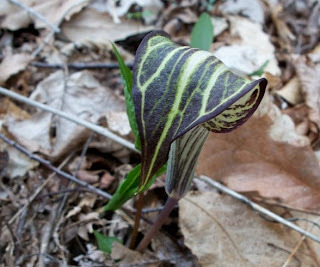 They tend to grow alone, not in large colonies, but they are scattered all over. They must like their privacy. They stay discretely covered. I added a few more to the pile. I do what I can to keep our section scenic. If I cross the highway or go over the hill into the Kingdom of Madison I tend to find different kinds of wild things. That little bit of variation in orientation on the mountain can change the character of the inhabitants. 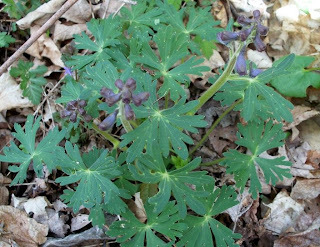 Yesterday I began the major chop for reclaiming a flower garden at Client #2's and found this along the wide trail headed into the woods. 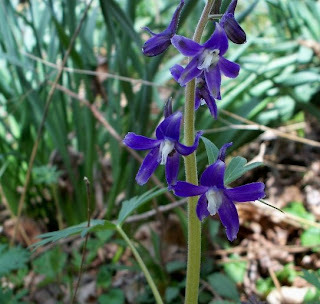 It is Delphinium tricorne, Larkspur. The convicts come up here regular to pick up trash along the side of the road. They come in a white van pulling a flat trailer with a port-o-let. It's a sight. Every once in a while they send the convicts way down the side of the mountain. 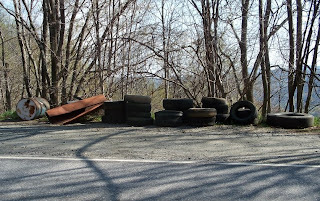 They pull all the big stuff up to the road from the local roadside landfills. Today there was a stack of a least a dozen tires. 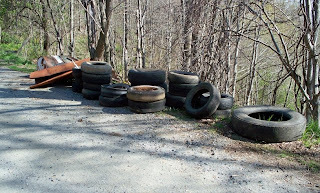 It made sense to add the one I pulled out of my place to the new pile of tires and save myself a trip to the real dump. 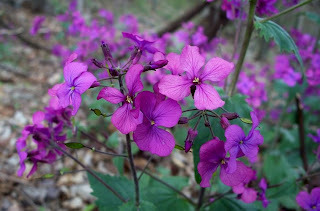 The most gorgeous flowers were blooming down there in the roadside landfill. 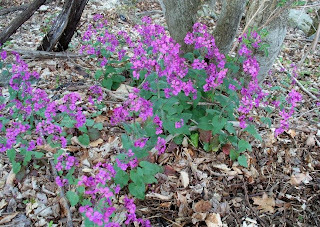 A big drift of Dames Rocket, Hesperis matronalis was in full bloom down there all by itself. Seeing all the junk the convicts hauled out of there, it is amazing they were not squashed. Just a couple of boards short. The windows in the front door wall don't have sills yet. I have done enough irrigation work in my life to know that missing a single piece needed for a job is typical. 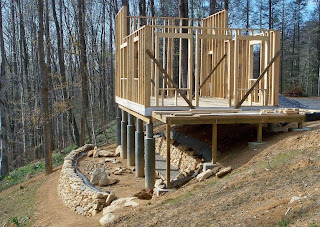 There are a few details that still need to be done on the wall framing, some adjustments made to one window frame and a close inspection of each frame section to make sure things are good, but now you can actually stand Inside my house. 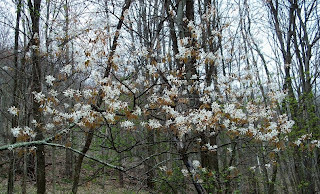 If you click on the picture to enlarge it, you can see the Hankodils blooming in the lower left at the base of the trees. Ten months ago a bulldozer and a trackhoe were grading a new road and creating a wide level spot on the point of a narrow ridge in the wilderness. 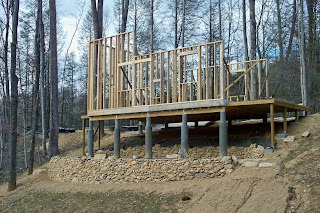 Today the walls of a small cabin are going up on the post and pier foundation and the floor that was built last fall. Two small flower beds have been cleared, mulched and planted. 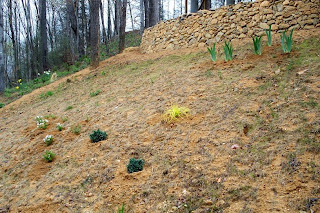 Other new plants have been placed in various spots around what will become a full garden over time. A vegetable garden has been cleaned and prepped. The first lettuces and radishes have germinated. The spinach and sugar snap peas look like they may have been duds. Two four foot tall, thirty five foot long, dry stacked stone walls are near completion. A general tidying up of the forest's messy deadfall is ongoing. I try to be helpful in my borrowed garden next door. Yet, the pace of things confuses me. 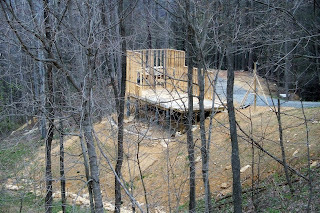 Shouldn't this tiny cabin be done by now? Shouldn't a garden have been fully planted? I arrived here with more determination than money. There is no budget to have Mario "Put it over there." My labor is a cost saving measure and the only source of labor. I want things done, but I can only do so much without wearing myself out. They have winter here you know and it rains quite often. 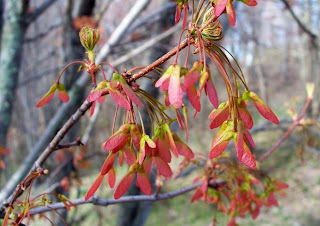 The trees are slow to leaf out. They take their sweet time. Other processes come first for many of them. My own garden is expanding slowly as well. A big chunk of that is due to the kindness of virtual strangers, cyberspace friends, who have sent me gardening care packages. These are treasures that I could not justify affording right now. 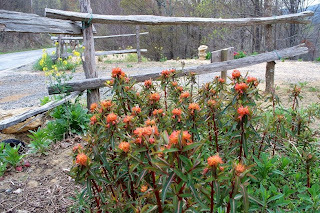 The Hankodils arrived last fall and were planted below the cabin at the forest edge, along what I expect to be a path into the gardens. 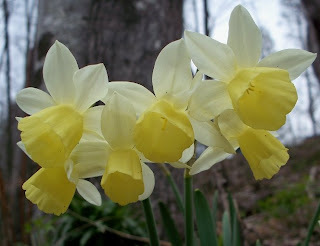 Narcissus 'Golden Ducat' blooms now, well after Bulbarella's main show next door. 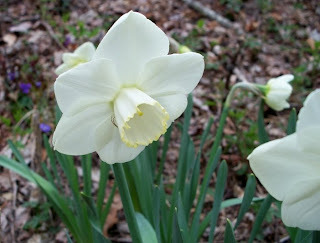 This one from the County Clerk was supposed to be Narcissus poeticus 'Green Pearl'. It isn't. It doesn't matter. I like it. 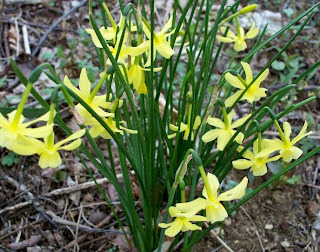 The care package also included Narcissus triandrus 'Lemon Drop'. 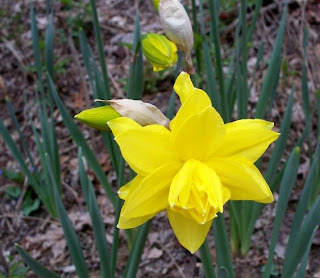 Narcissus odorus 'Linnaeus' bloomed first and was past its prime. It was no longer ready for a closeup. Puschkinia libanotica also put on a very good bloom in its new home. 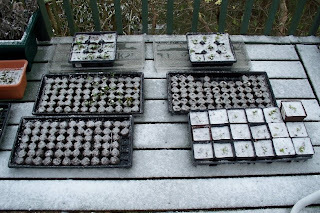 Four flats of seeds from the care package are germinating on the deck. 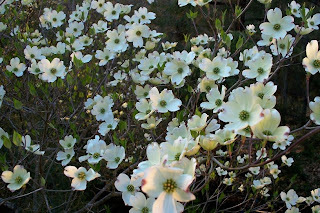 Once our last frost date, around May 15th, has passed they can all be safely planted in the ground. The Tulizabeths turned out to be the Mama Mia from ColorBlends. 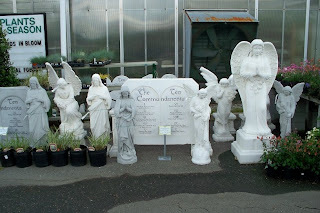 They came from Elizabeth of GardenRant and Gardening While Intoxicated. She also sent me Scilla siberica, and Chionodoxa forbesii, both of which came up and bloomed nicely. 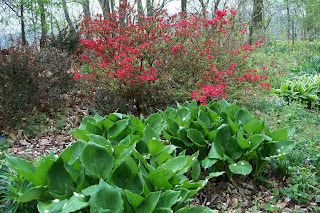 By the time my new fall planted ones had bloomed, I had posted so many photos of Bulbarella's same bulbs that it seemed redundant to show you mine. 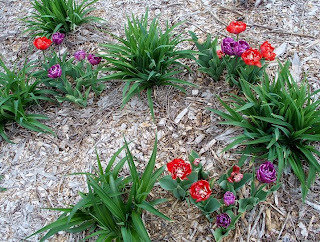 The repeated bulbs will give these two gardens some cohesion and continuity. One will flow seamlessly into the next. Elizabeth did send me something that Bulbarella might not have, if that is possible, some Ixiolirion tartaricum, Lavender Mountain Lilies. 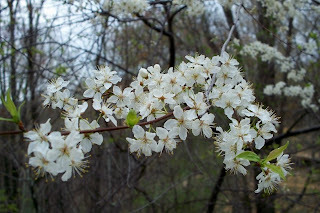 They are early summer bloomers. They have come up, but are looking rather meek at this point. Mama Mia at the top of my driveway with Daylilies to grow and hide their foliage. 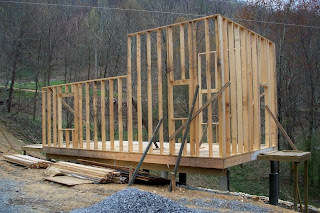 Another wall was built and added to the cabin. Tomorrow the front door wall should get built and stood up. The kitchen/dining nook windows. I think they are about a quarter to half inch different in the framing. They are on separate wall panels. I'll have to make sure the windows are set even. Of course the walls themselves need to be checked for level and plum too. 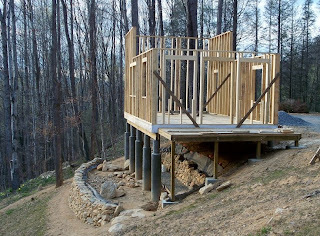 A cabin grows, a garden expands, at the pace at which it is happening, one thing at a time. The first of many Iris has bloomed in my borrowed garden next door. I have been offered many plants, many times. The garden is a huge resource of free material, but digging and transplanting things takes time. The time to do that has to be found. The miniature Daffodils, barely eight inches tall are one of the last to bloom. If I don't take the time to meander through the gardens and the forest on a regular basis I might miss out on something on miss learning something new. Meandering outside is good for the soul after a day of hard work. It rejuvenates my aching muscles and helps me go on. Having the option to meander is a goal of all this hard work, but it seems you have to meander to reach that goal. My cozy little cabin is budding out. 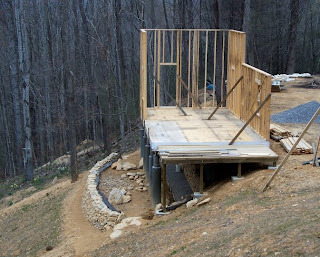 Two more sections of wall framing were raised today. 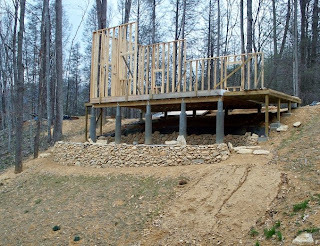 Now that there is room on the floor, the next two sections can be built and raised. There is a lot of rubber necking as people drive by on the highway. 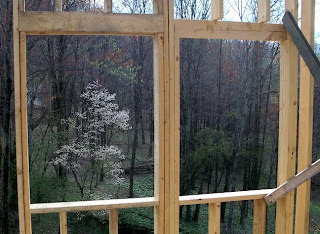 Soon the trees will leaf out and I will be screened from view once more. By next spring this should be part of the view from my kitchen window. From inside my cozy little cabin outside of Clyde. 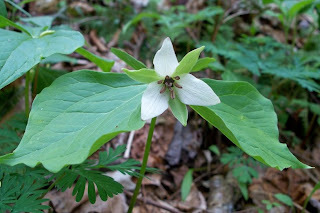 Trillium grandiflorum was the first to bloom. 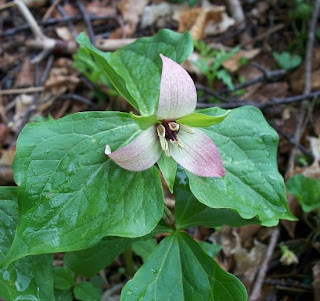 Followed by Trillium catesbaei that was located in another patch a bit further down the stream. 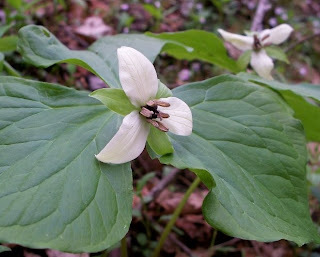 Now there are three Trillium species. So far. I had seen this group before. It looked like it had no flower buds and was not going to bloom. 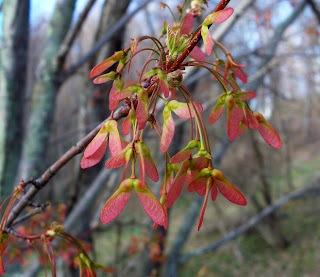 Looking closer today I saw some buds and then found the flowers hiding under the leaves. I pulled the flowers up to the top of the leaves to get their picture. 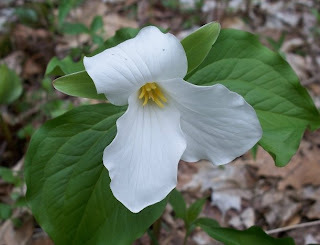 Trillium number three, Trillium cernuum, the Nodding Trillium.